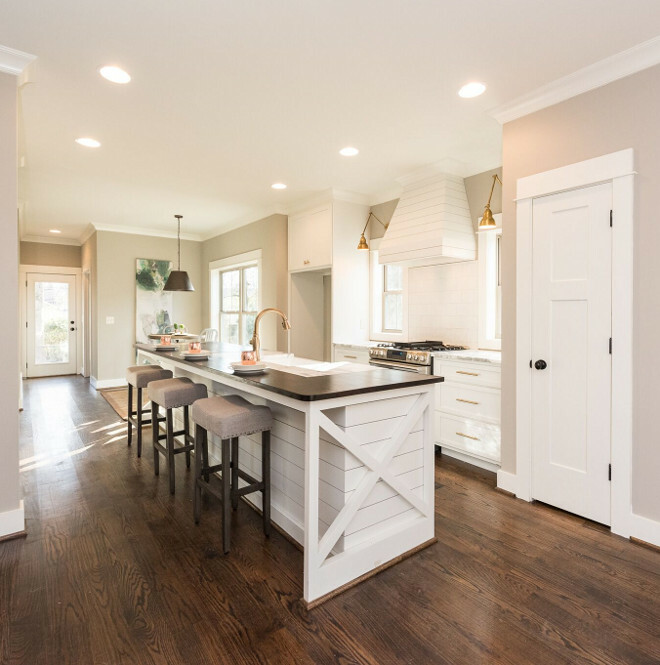 Regardless of budget, farmhouse is truly one of the most requested styles of the moment and it can look beautiful in a multi-million house or in a more affordable home like we’ll see today. 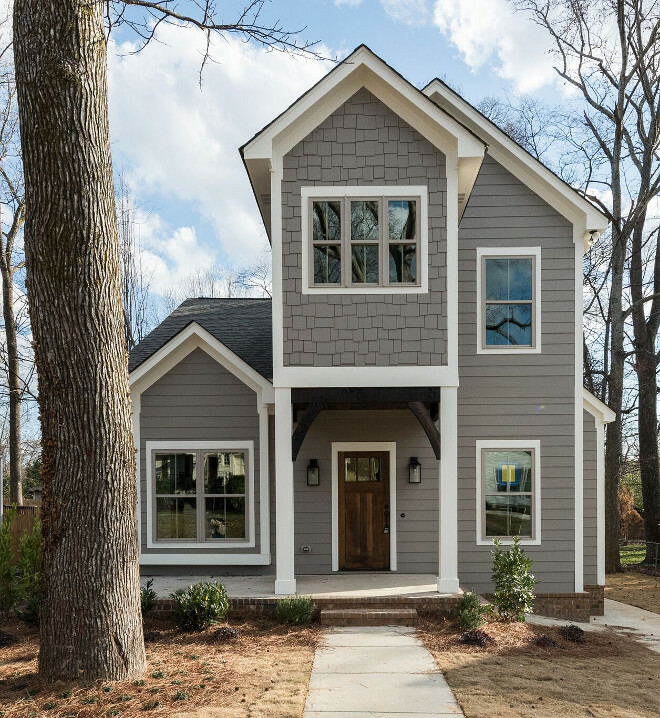 Built by a talented team, Willow Homes worked hand-in-hand with their in-house design team, Willow Design Studios, to build this spec home. The home is currently for sale in the highly desired area of Edgewood in Homewood, Alabama. It is a walkable neighborhood full of young families with children. 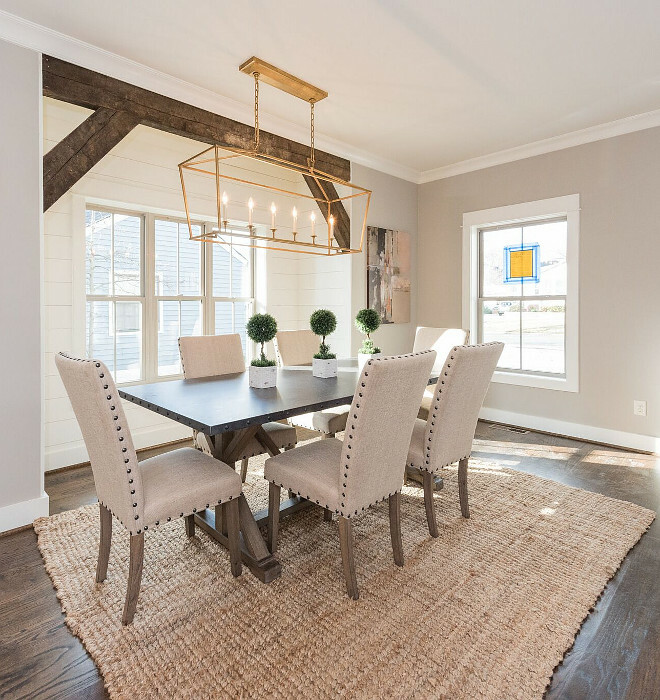 This cute home features everything a farmhouse enthusiast loves; plenty of shiplap, butcher block countertop, reclaimed brick and fun lighting! 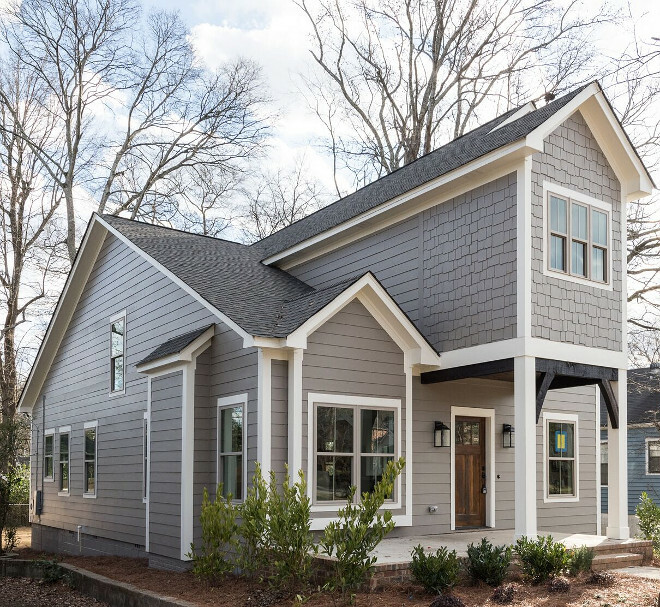 Take notes on the affordable solution for this newly-built farmhouse-inspired home. I think you guys will love this one! Exterior Paint Color: Grey Siding Paint Color: Dovetail Sherwin Williams. White Trim Paint Color: Sherwin Williams SW7010 White Duck. The front door features a custom Minwax stain mix. Tip: This is really a great exterior color palette. Make sure to save it or pin for future references! This house was just built and is currently staged for sale. 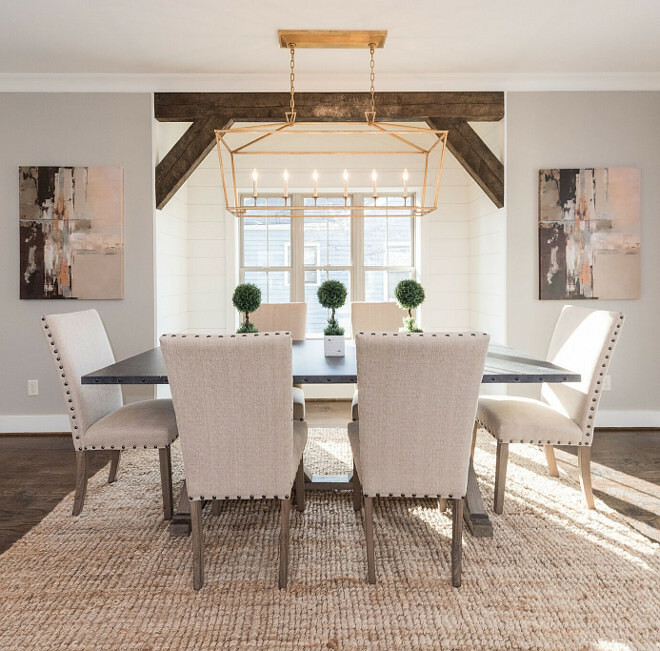 I would love to see some light window treatment to complete the feel of this space, but what you really notice here is that farmhouse fireplace! 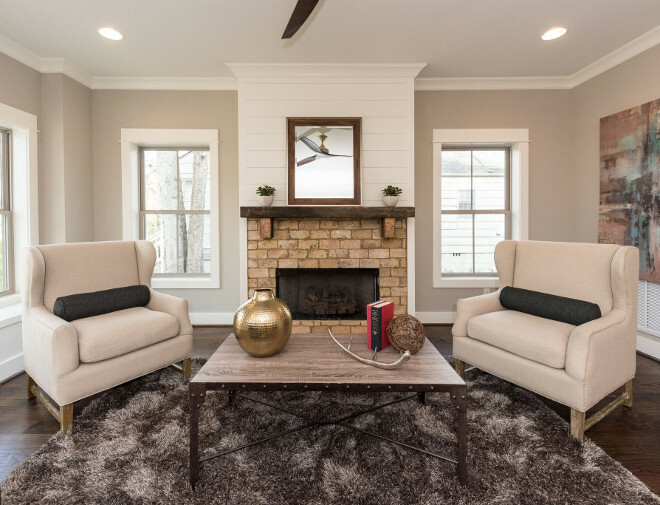 Farmhouse Fireplace: Shiplap is painted in Benjamin Moore White Dove. 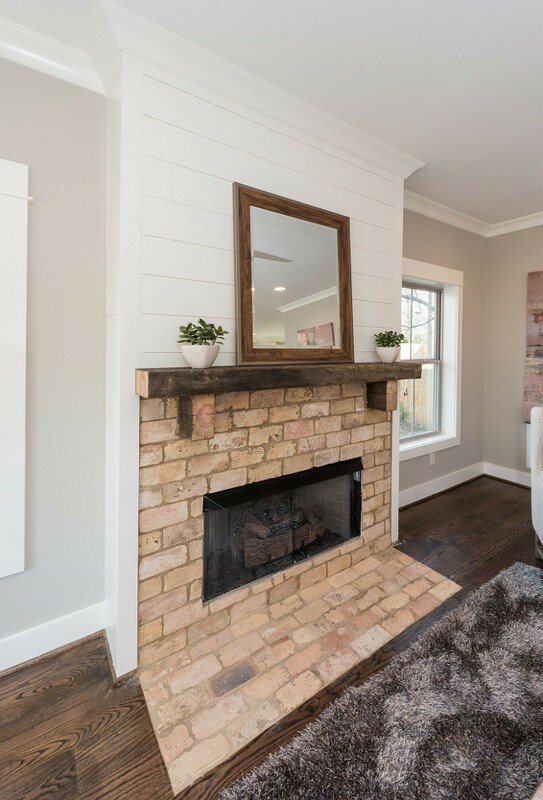 Brick is reclaimed old Chicago brick and the mantle is made of reclaimed wood. What a great layout for narrow kitchens! 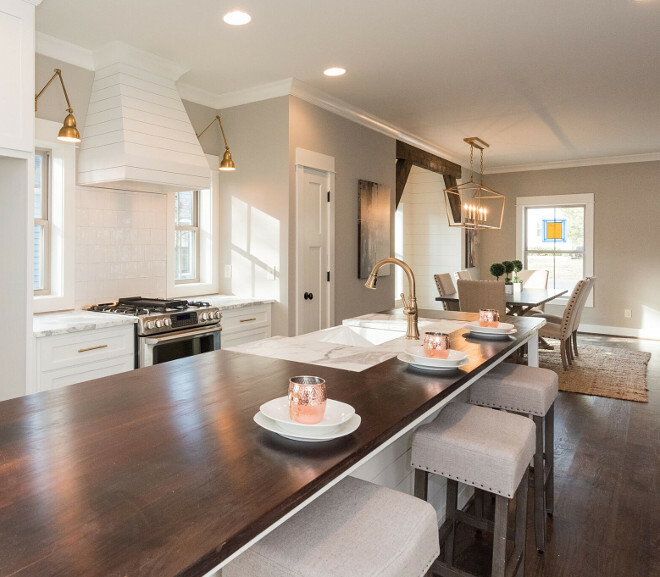 I love the open layout, the long shiplap island and the custom shiplap hood. The cabinets are constructed of Birch. 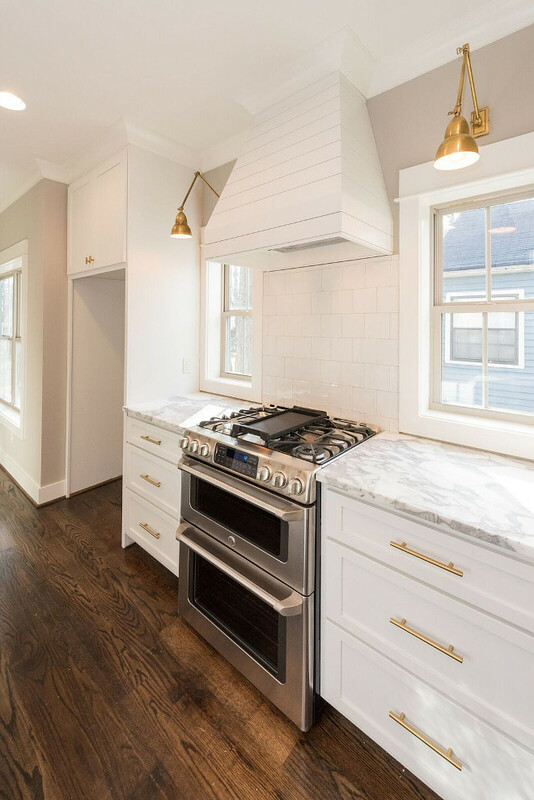 The custom shiplap hood and cabinets are painted in Benjamin Moore White Dove. The cabinet hardware is brushed brass modern cabinet pulls. Backsplash: Hand-made 5×5 white glaze kitchen backsplash. Floors: Flooring is 5” oak wood floors with custom mix of Minwax stain. 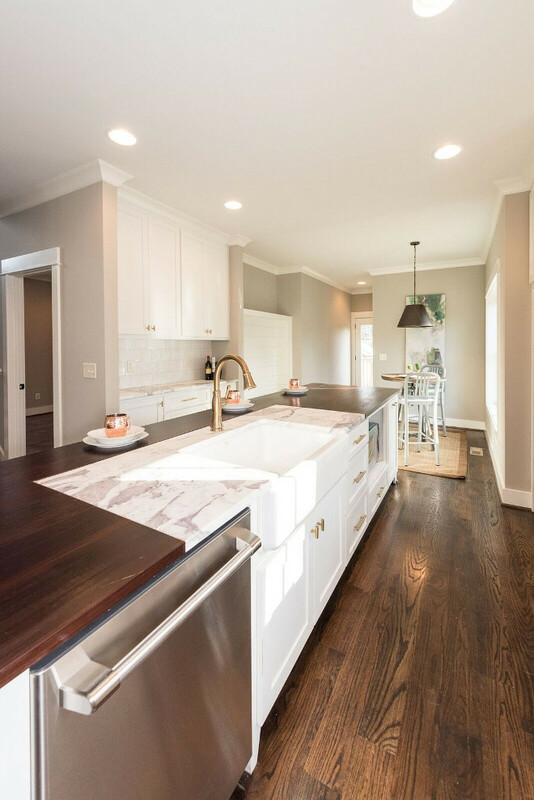 Island is 127″ in length and features a poplar wood top with a marble sink surround.The island also features space for a microwave and trash pull-out. Sink is Kohler 36″Farmhouse Sink. 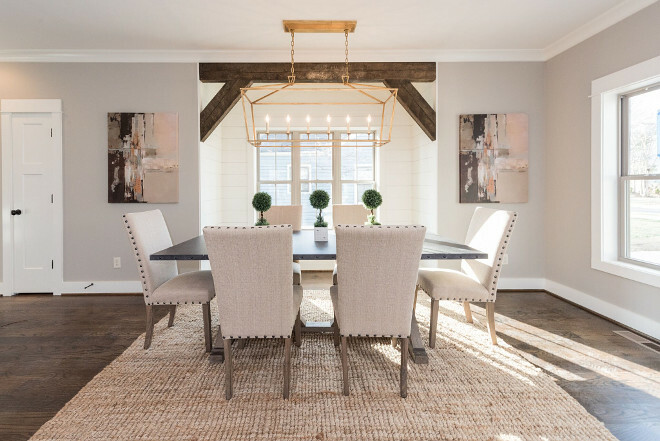 The reclaimed wood beams used in the dining area and as the mantle in the living room were actually up cycled from a home that was falling in from neglect. Jason Hale, owner of Willow Homes, put these beams in storage until he could find the right home for them. This home was the perfect fit. Main Floor Paint Color: Sherwin Williams Amazing Grey. Lighting is a Darlana 6 Light 54 inch Gilded Iron with Wax Linear Pendant Ceiling Light. 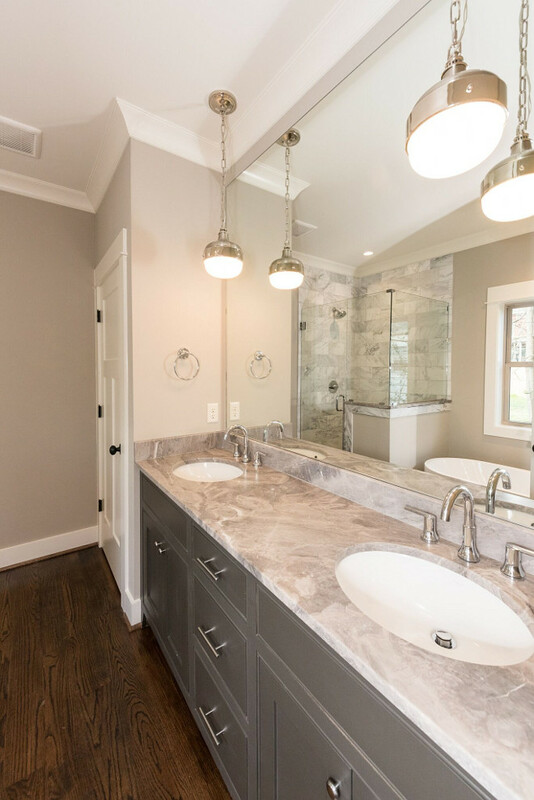 The master bathroom features a beautiful white and grey countertop; “Silver Fantasy Marble” – honed. Lighting is Feiss Pendants in chrome. The bathroom wall paint color is Amazing Grey by Sherwin Williams. Trim paint color is White Dove by Benjamin Moore. 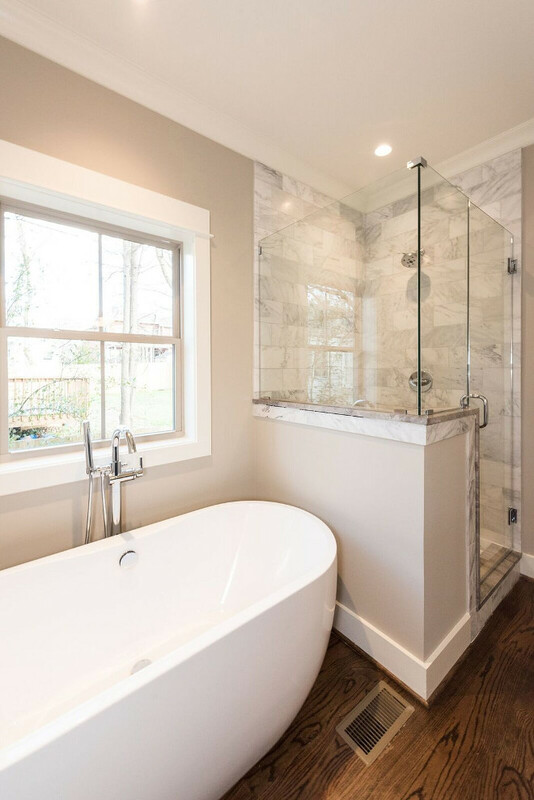 Shower tile is 6×12 Carrara. How are you guys doing today? I hope everything is good with you, that you’re feeling healthy and are surrounded by the people you love. I also hope that the time you spent here made you feel calm and at peace.